We had a couple of updates to share this week from the Google Docs and Google Calendar teams. First, as you may have heard, the Docs team launched the ability to create and share presentations to go with existing document and spreadsheet capabilities. Now when you're collaborating on that strategy deck, you don't have to worry whether you're looking at version 5 or 15. Plus, having your presentation stored online means one less file to send as an email attachment. I laugh when I remember what I was like as a new mom. I was determined to be perfect: feeding only homemade food that I blended or pureed myself (great book about this btw) and organizing toys into drawers with labels like cars, puzzles, and blocks. But when the reality of every day life sets in, it's almost impossible to keep that up. Nowadays, I'm just proud when my house doesn't look like a hurricane just blew through it and my kids have eaten something green for dinner. Lots of things I do work this way. Take email. First, I make very specific labels for all of the categories that I might need - meeting notes, action items, personal - and I very meticulously use these labels for maybe a month or so. But then, I get overwhelmed and don't have the time to spend filing things under each of these categories. This is the point where Gmail really starts to help me out. The reason I categorized everything in the first place was to find it again quickly, right? Well, if I can find anything easily with search, then why should I take the extra time organizing? For my purposes, searching takes much less time and works just as well. Now, when I'm done with an email, I archive it. It's not deleted, but I don't have to see it and I can find it quickly anytime. And every day I have a few more bits of time to spend having that wonderful glass of wine after the kids go to bed - oh, and more time to spend with the kids too. "I love Gmail's archive and search features. They give me license to get e-mails out of my inbox quickly without fear of losing them. It took me a little longer to appreciate the Labels feature. Now, I'm in love. Each of my kids gets a label so I can look at e-mails that apply directly to them, whether it be about playdates, school, or activities. I also have labels for my real job, my podcast, my blog, and other blog networks I belong to. And if e-mails ever fall in more than one category, I give them more than one label. It makes things really, really easy." Send your own work-life balance suggestions to digitalmomtips@gmail.com and I'll share them here. When you get an email that references an address, look to the right and you'll probably see a link from Gmail pointing you to a map of the address on Google Maps. Gmail also recognizes email text that refers to an event (e.g., 'dinner tomorrow at 8pm'), and will give you a link to add it to your calendar. It'll even pick up on package tracking numbers from UPS and link you directly to the tracking page, so you don't have to copy and paste the number. I really like this last one when I order stuff online and want the instant gratification of knowing a package is on its way. It can be really annoying to write up a whole response to an email and click send -- only to discover that someone else has already responded. Gmail has a little feature that helps solve this problem. When you're replying to (or reading) a conversation, and someone else replies, a small notification window pops up to let you know. I sometimes think of it as the "prevent embarrassment" notification. Plus, it can save a lot of time by avoiding the series of follow-up emails needed to clear up the confusion. Most people know that searching your archive is a huge part of what makes Gmail useful. But there are a few search features that you may not know about, which can be really handy. For instance, if I want to narrow down my search to only messages sent from Kevin, I can just add "from: Kevin" to the query. You can even search only for messages with attachments by including "has: attachments," or narrow by date with "after:" and "before:" Check out this whole list of advanced search operators. Offline chat is another feature which makes chatting in the context of your email particularly useful. When you're chatting with a friend and they suddenly go offline, you can keep sending IMs and your friends will receive your messages the next time they open Gmail. The chat will show up as a new item in their inbox. And, of course, if you're still online, your friend can go ahead and reply by chat. Since I use Gmail and Google Calendar at work (through Google Apps), I'm constantly emailing people about meetings, and scheduling them on everyone's calendars. When I'm writing an email to set up an event, I can actually do it all from within Gmail by clicking the "Add event info" link below the subject line. Then choose the time and location for the meeting or party. When you send the email, the event details will be added to to your Google Calendar, and Gmail will send an invitation to the email recipients to add it to their calendars as well. Recently, the Internet has been abuzz over a new term: 'bacn' - with the requisite missing vowel - which is pronounced, you guessed it, "bacon." Wikipedia defines it as: "electronic messages which have been subscribed to and are therefore not unsolicited but are often unread by the recipient for a long period of time." Or, for the rest of us, bacn is "email you want, but not right now." I get a bunch of messages every day from sites like Twitter, LinkedIn, Facebook, and Google Docs & Spreadsheets, all of which are important to me but which I don't need to see immediately. In fact, I'd like to defer them until later, for my late-night Family Guy-email sessions. 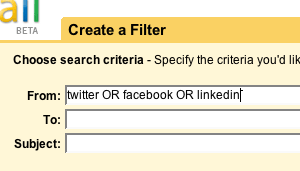 2) Create filters to put bacn in its place by clicking "Create a Filter" next to the search buttons at the top of your inbox. First, tell Gmail what types of messages you'd like to filter. I typed "LinkedIn" in the "from" box and then clicked "Next step >>". If you're like me, you probably want to review the notifications at a later time, so you click "Skip the Inbox" and "Apply the label: LinkedIn". This keeps all your notifications in one place, accessible by clicking the "LinkedIn" label on the left hand side of your inbox. Now I can easily view my LinkedIn notifications all at once OR I can view all my bacn together by clicking the "Review Later" label.